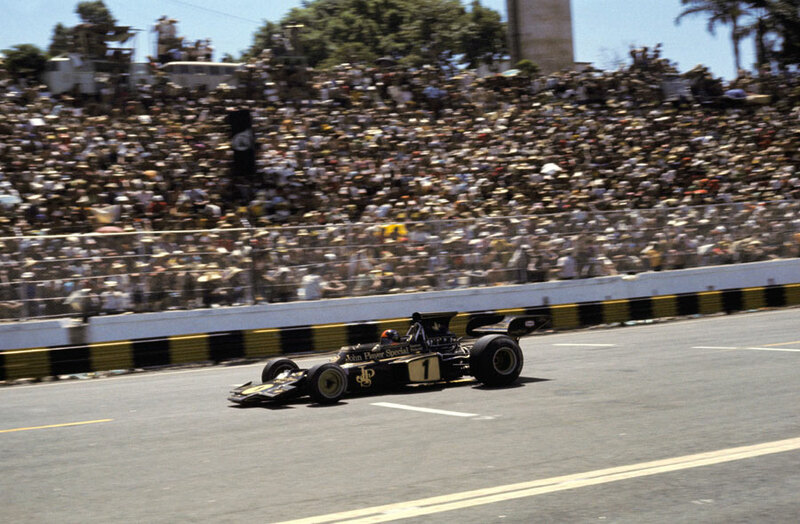 Brazil's inaugural grand prix produced the dream result for the home fans as countryman Emerson Fittipaldi took victory at Interlagos. The two Lotus 72s locked out the front of the grid with Ronnie Peterson taking pole position ahead of Fittipaldi with another Brazilian, Carlos Pace, qualifying his Surtees on row three. And it was Fittipaldi who made the best start to lead the field with Pace bursting through to take second place from Jackie Stewart's Tyrrell. Next came Peterson and the Ferrari of Jacky Ickx. The Brazilian 1-2 was short-lived as Stewart moved past Pace for second place and Peterson also squeezed by, the Lotus recovering from its sluggish start. Peterson then set about Stewart and was on the verge of taking second position when a wheel failed and he crashed out at high speed. Ickx took third from Pace who was struggling with a rear suspension problem that caused him to retire eight laps into the race. Denny Hulme muscled his McLaren into the top six by passing Jean-Pierre Beltoise's BRM and then he moved ahead of Ickx for third place as a slow puncture forced the Belgian to pit. Beltoise inherited fourth until his BRM stopped with electrical problems, promoting the BRM of Clay Regazzoni up to fourth until a tyre stop llowed Arturo Merzario's Ferrari ahead of Ickx and Regazzoni. But it was Fittipaldi's day to the delight of the assembled throng, Stewart and Hulme joining the celebrations on the podium.